Central, Clinton, Capital and cheese, the centerpieces of contemporary Little Rock tourism, represent not only the top charms of the city but also cornerstones of American history, charismatic hospitality and culinary delight. 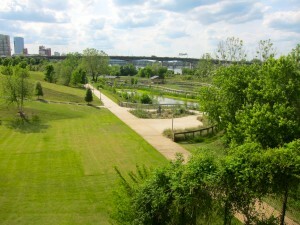 All are musts when visiting Little Rock. In 1957, nine courageous African-American students braved contentious crowds to test the 1954 U.S. Supreme Court ruling that declared segregation in public schools unconstitutional. 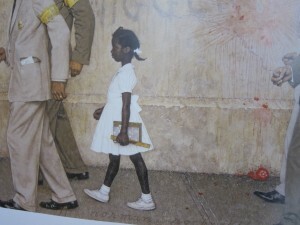 The students and their school, Central High School, skyrocketed to fame, winning a battle for equality and earning a revered place in American history. 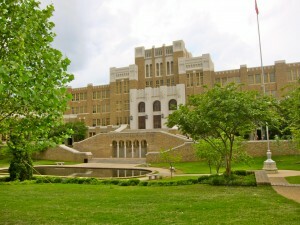 Today the still functioning high school sits within the boundaries of the Little Rock Central High School National Historic Site. Central High School’s Visitor’s Center (located across from the school and interesting itself) arranges emotionally packed tours for groups of 10 or more when the school is open. 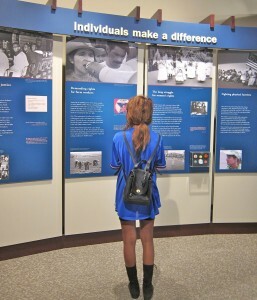 A visit belongs on the curriculum of every man, woman and child interested in courage, equality, education, race relations and American history. 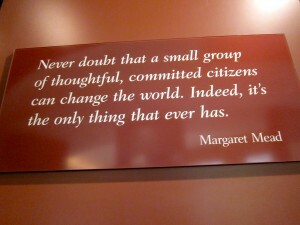 Central High School provides living proof of Margaret Mead’s declaration that a small group of committed citizens can change the world. 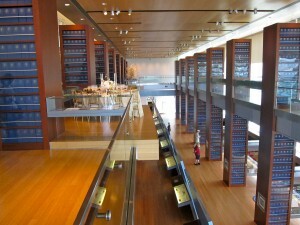 One can’t visit Little Rock without stopping for a tour at the Clinton Presidential Library and Museum located on the banks of the Arkansas River near the downtown River Market district. 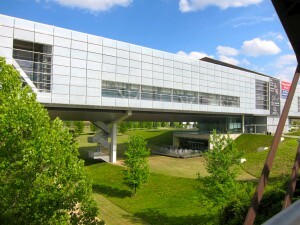 The Library’s modernist, industrial-style main building, designed to represents a bridge symbolizing Clinton’s campaign promise of “building a bridge to the 21st century” is praised for it’s energy efficiency and environmental soundness. 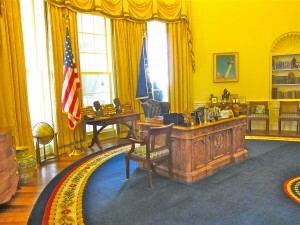 Its exhibition spaces showcases a treasure trove of personal, official and public documents, photos, films, memorabilia and all else representing the 42nd president’s eight years in office—even full-scale replicas of the Clinton-era Cabinet Room and Oval Office. In addition, the main structure contains a restaurant on the lower level (open to the public on Monday through Friday for lunch only) and Hillary and Bill’s private residence on the upper level (not open to the public). Archives held in the Library are open by appointment only. 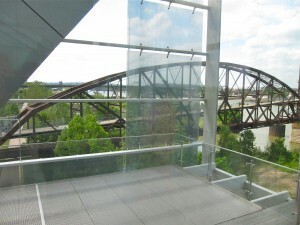 Visitors can supplement a museum and library tour with a stroll in Riverfront Park (the park on which the Library sits) and can catch a shuttle to the Clinton Museum Store to load up on “I miss Bill” t-shirts and other Clinton-related souvenirs. 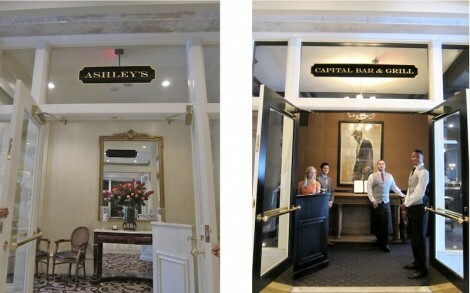 Named because it was a capital enterprise, located in a capital building in the capital of the state, The Capital Hotel is a capital success. 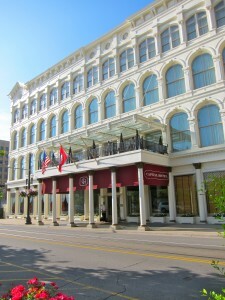 Opening in 1876 with such extravagances as indoor plumbing, heating and a “magnetic annunciatior” for calling room service, the hotel quickly earned the reputation as a luxury property, a status that remained through the years despite (or maybe because of) multiple closings, renovations and reopenings. The latest (2007) reincarnation beautifully weaves the old historic with the best contemporary. 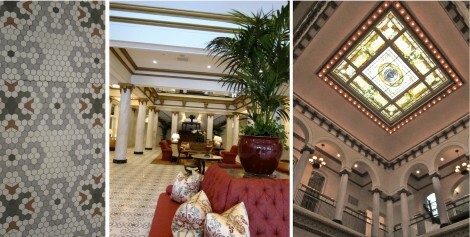 The hotel was listed on the National Register of Historic Places in 1974, so all renovations since have meticulously respected the historic aspects of the property. Today’s guests can still ride the huge elevator, said to be built to accommodate President Ulysses S. Grant’s horse (or more likely, the hoop skirts of Southern belles). Guest can also enjoy the graceful lobby with original colorful tile floor and white marble walls that beautifully framed the elite of times long gone. 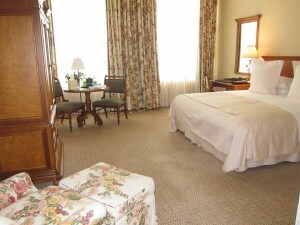 Although Victorian charm abounds, contemporary Southern comfort fills the lovely 94 guestrooms. Amenities include high definition LCD TV’s, free WiFi, Frette bed and bath linens, Molton Brown bath products and a welcome snack of positively addictive-spiced pecans (recipe below). Combine all ingredients in a mixing bowl. Adjust seasonings to personal taste. 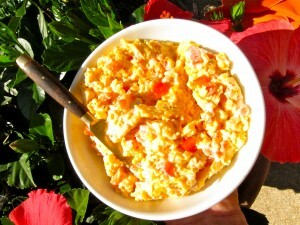 NOTE: Add mayonnaise according to your own taste—start with 4 tablespoons and see if you would like more. Put syrup in a heavy saucepan. Set saucepan over medium heat and bring the syrup to a simmer. Add pecans. Raise heat so that syrup gently boils. Boil the pecans about 10 minutes. Meanwhile fill a deep fryer with oil and heat oil to 375°. Drain pecans thoroughly and pat dry with paper towels. Combine salt and pepper in a large bowl. Put pecans in the 375°F oil and fry approximately 30 to 40 seconds. 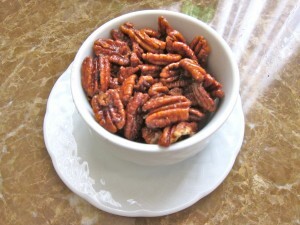 Remove pecans from the fryer, drain well and toss in the bowl with salt and pepper. Spread pecans on a baking tray and them to cool completely. Put water and sugar in a medium saucepan and bring to a simmer. Simmer, stirring constantly, until sugar completely dissolves. Remove from heat and let syrup cool completely. Refrigerate in a covered container until ready to use. Can be used in a variety of recipes. « TEN THINGS TO LOVE ABOUT L.A.